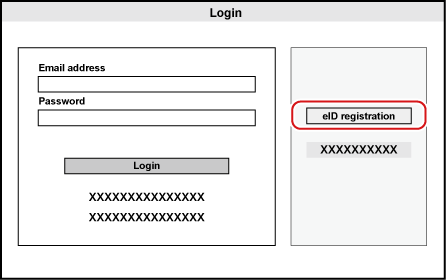 Activation of the serial number and eID is required to use a Grass Valley product such as EDIUS or Mync. At the first startup after installation, the activation screen for the serial number and eID is displayed. The software starts up after a successful activation. Activation of eID is optional when you use EDIUS Workgroup. Before starting installation, close all other applications including resident software. Installation requires the account authorized for the administrator (such as PC administrator). Applications to be installed and setup files necessary for installation may differ depending on model. Make a backup of the customized settings such as keyboard shortcuts and then uninstall EDIUS before installing the latest version. If antivirus software (security software) is running, you may need to stop the software operation. eID is an online ID function to link the license of Grass Valley products in possession to the user. The license will be more secure and the uniqueness of the license will be established by linking the serial number and eID at the time of first activation of the serial number. Also, the information of the serial number in possession can be browsed or products can be downloaded on the membership website “eID Web” that can be logged in with eID. Use eID after fully understanding this manual and the precautions on the website. Recommended environment of eID Web is as follows. The [Enter e-mail address] screen appears. 3) Enter an e-mail address to register. Make sure to use an e-mail address and password to register different from the ones for other ID services. The e-mail address and password used in multiple services will have higher risk for unauthorized access. The e-mail address that has been registered in the past cannot be used. When the screen indicating preliminary registration completion appears, close the window. Preliminary registration completion e-mail describing the procedure to permanently register is delivered to the registered e-mail address. The registered e-mail address and password are sensitive information that should never be disclosed to others. In case they have leaked, immediately change your e-mail address and password. We are not liable for the leakage of the e-mail address and password not related to this system. Complete the permanent registration within the expiry date which is written in the preliminary registration completion e-mail. The information registered with preliminary registration is deleted if it is not completed within the expiry date. 5) Click the permanent registration URL described in the preliminary registration completion e-mail. 6) Enter registration information such as [Password], [Date of birth], and [Country of residence]. The [Confirm registration] screen appears. 8) Confirm the details to be registered, and click [Registration]. The [Registration completed] screen appears. Registration of eID is completed.